Screenshot of the Bluefire app library page. The book "Meet You in Hell" is a library book. I read electronic books on my Kindle. The easy way to get them is to download from the Internet various free items (public domain) or purchase them directly from Amazon. The difficult way is to download them from my online digital public library (in my case that would be OSL, Ocean State Libraries, in RI). Those books must be in Mobipocket format and I need to convert them using some Python script in command mode. I am told that by October of 2011 Amazon will allow libraries to loan digitized books in Amazon format (AZW) at which point the method I presently use will no longer be necessary. We shall see. I also read electronic library books on my iPad. The books that I am able to read are either in PDF or EPUB format. The process is a little involved but I think I finally have it down. The method below should work well if you have either a PC or a Mac as your main computer. I have a PC. If you find any problems or errors with these instructions, please let me know so I can make modifications if necessary. Feedback is appreciated. Also note that there may be other ways to do this. I am just describing what works for me. 1. You must have a library card for your local library. This card will usually allow you to have access to the state library association web page. You use the library card ID number to log on to your digital loans section of the state library organization. Read all instructions that the library provides. 2. Install Adobe Digital Editions on your PC (OSX, Windows or Linux). Run the program. “The first time you run Digital Editions, you are prompted to authorize the application by entering an Adobe ID. If you don’t have an Adobe ID, you are provided with a link to get one. Then, when you purchase an item online or borrow one from a library with Digital Editions, the item is automatically “tied” to your Adobe ID, rather than your computer. This way, you are free to move your items to up to six computers and six devices that have been authorized with Digital Editions.”1 Remember this ID! 3. Install Apple iTunes (the latest version) on your PC. It is already on your iPad. 4. Install Bluefire Reader on your iPad. 5. Download the book you want to read from your library. Make note of what folder you saved the book to. You will need to know this later. Go to the Bluefire home page and click on the “Help” button. The first Help topic under the “FAQ” section is “Can I open my Library Books in Bluefire Reader?” This topic has a link that you must now click on, Using Library Books in Bluefire Reader. After arriving at the link you should print out the entire 4-page document. It contains the instructions you need to use. • The section titled “Downloading with Adobe Digital Editions” says “When Digital Editions sees the .acsm file it will automatically download the PDF or ePUB file, which is the actual eBook…” In my experience, this does not happen. Rather, you should first find the .ascm file that was downloaded. If you specified a directory when you did the download from the library (see above) that is where you will find it. Next, right click on the file name. A menu will appear. Click on “open with”. A submenu will pop up. Here you choose “opens in Adobe Digital Editions”. • Adobe Digital Editions (ADE) will open and the book should appear in its library. You can now read the book on your PC, but that is not what you are trying to do. You want to read it on the iPad, so, continue with the next steps. 7. Go back to the Bluefire Reader instructions that you printed out. Begin reading on the third page under “Transferring eBooks to Bluefire Reader”. Follow the instructions to the letter and you should be reading the library book on your iPad in no time. Please note that you will have to attach the iPad to the PC by the USB cable that came with the iPad. Do that first. You may find that iTunes opens right away and the iPad starts its sync and update sequence. Let all that happen. You don’t want to continue trying to transfer a book to the iPad while it is updating. Also, if this is the first sync performed since loading the Bluefire app on your iPad, it is necessary for iTunes to update its app list. 8. 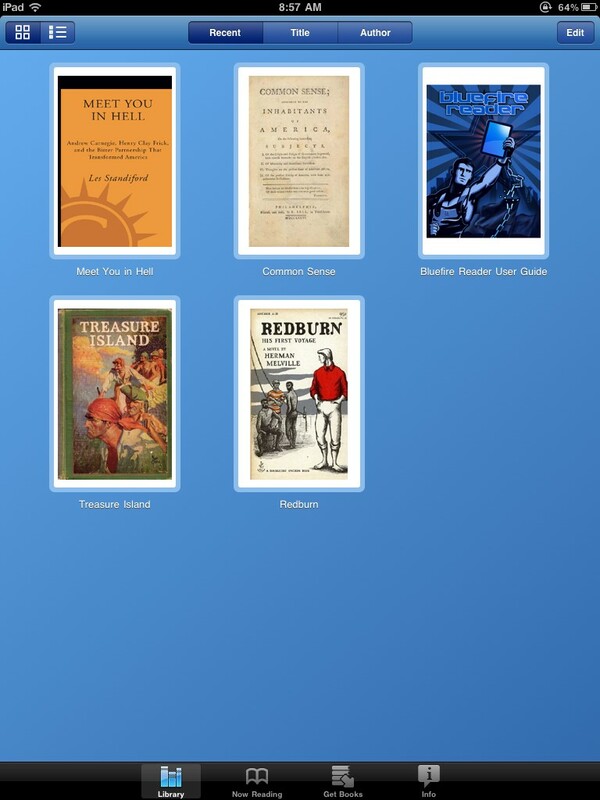 If all goes well the library book will appear in the ‘library’ of the Bluefire Reader app on your iPad. When the library loan time is over (3 weeks at my library) the book will no longer open. Also, some libraries allow you to return a book early. That’s another story. This entry was posted in Books...all kinds, Modern Technology, Occasional Commentary and tagged epub pdf apple, iPad Library books reading downloading Bluefire app. Bookmark the permalink.